An application for an Interim Materials District (IMD) has been submitted to extract up to 1,000,000 cubic yards of material, over a 10 year period, within a 22-acre site. The Planning Commission will conduct a public hearing on this request on June 15, 2015. Return written comments by May 20, 2014. Thank you for your review. If we do not receive comments from you we will assume you have no objections to the proposed project. An application for an Interim Materials District (IMD) has been submitted for the extraction of up to 1,000,000 cubic yards of material over a 10 year period, within a 22-acre site. The Planning Commission will conduct a public hearing concerning this application on Monday, June 15, 2015 at 6:00 p.m. in the Borough assembly chambers at 350 E. Dahlia Avenue, Palmer, Alaska. The application materials may also be reviewed in the Borough Permit Center. If you have questions or want to submit comments, please contact Mark Whisenhunt at 861-8527 or email: mwhisenhunt@matsugov.us. Comments may also be faxed to 861-7876 or mailed to MSB Development Services Division, 350 E. Dahlia Avenue, Palmer, AK 99645. This entry was posted in Issues on April 30, 2015 by Chris Boone. 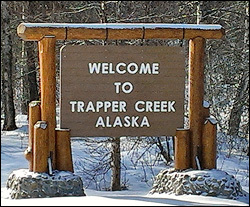 The Alaska Department of Transportation and Public Facilities (DOT&PF) has assumed the responsibilities of the Federal Highway Administration under Section 326 of amended Chapter 3 of Title 23, United States Code (23 U.S.C. 326), and is soliciting comments and information on a proposal to replace the Parks Highway bridges crossing Sheep Creek (Milepost [MP] 88) and Montana Creek (MP 96). The proposed project is located in the Matanuska-Susitna Borough, south of Talkeetna, Alaska. The purpose of the project is to maintain a safe corridor along the Parks Highway, where two bridges have been identified as having structural deficiencies requiring full replacement. The proposed work would construct new bridges, either at or adjacent to their current locations. This project would include in-water activities, pile driving, utility relocation, and constructing temporary or permanent approaches and access to the main highway. Pedestrian facilities across, to, and along the streams may need to be reconfigured or reconstructed, but access would be maintained or improved. Access would also be maintained as practicable during construction. Construction is anticipated to begin Winter 2016 and be largely complete by Winter 2017. This proposed project will comply with Section 106 of the National Historic Preservation Act; Executive Orders: 11990 (Wetlands Protection), 11988 (Floodplain Protection), 12898 (Environmental Justice); the Clean Air Act, Clean Water Act, Fish and Wildlife Coordination Act, and U.S. DOT Act Section 4(f). To ensure that DOT&PF has identified key issues and that your concerns and ideas are considered, please send written comments to the following address by May 22, 2015. This entry was posted in Issues on April 28, 2015 by Chris Boone. I. Meeting called to order 6:43 pm. II. Board Members in Attendance: Miller, Glenka, Kolbeck and Grelson. Members Present: Lon McCullough, Rick Ernst, Lynn Moore, Randy Crosby, Lon McCullough, Shawn Stankowitz, JP Glenka, George and Kay Faerber, Earl Boone, Kristie Parsons, Jim Schorr and Duronda Twigg. Political Officials Vern Halter, Assembly; Randall Kolwalke, Assembly Candidate; and Mayor Larry DeVilbiss in attendance. III. Minutes were read. Correction to minutes discussed as not acceptable because no motion was made regarding accusation of complaint. Minutes approved. IV. Assembly Report: 1) Spoke to Eric Phillips re the Double Vault toilet. Eric said can convert money to new building CIP project as needed but need a plan for use of the money. It will take legislation before Assembly to do that, so would like to get this done this spring so you can complete your project this summer. 2) Full Assembly Budget Cycle meeting at Willow Community Center on May 7th at 6 pm. Encourage attendance. V. TCCSA CIP Report: $32,343.30 Remaining. Consider bidding out entire project instead of individual jobs. VI. RSA 30 Report: No representative was present, although Assemblyman spoke about the Mat-Su contractor facing safety, and wage citations over troubled salmon project on Oilwell Road. A. 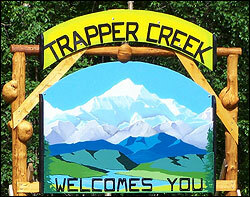 Petition to Trapper Creek Community Council accepted. Date and time of general meeting to be scheduled once Council collectively reviews their schedules. Notice to be posted 7 days prior. All applications for FY2014 Revenue Share were found to meet the requirements and will move on to the community voting process. A. Spring Clean-Up date set for May 16 & 17 and picnic at park 5 pm on May 17th. XIII. Date of next meeting scheduled for May 21, 2015 at 6:30 pm. This entry was posted in Meeting Minutes on April 23, 2015 by Chris Boone. This entry was posted in Meeting Agendas on April 23, 2015 by Chris Boone.